Sunrise with lion sitting next to waterhole watching hippos swimming in water. Wide of two rhino and two hippos resting peacefully together in the water. The rhino roll in the mud. 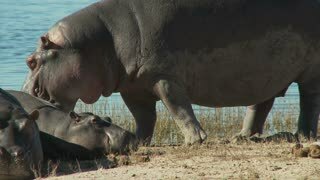 A mother and baby hippo snuggling under water at a zoo. This close up video shows a hippo drinking water. Crevalle jack, Caranx hippos, also known as common jack, black-tailed trevally, couvalli jack, black cavalli, jack crevale or yellow cavalli. 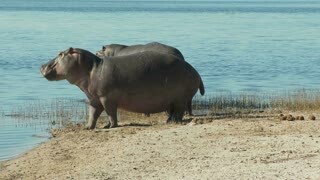 A small raft of hippos wading in the water in Africa as one submerges under the water.